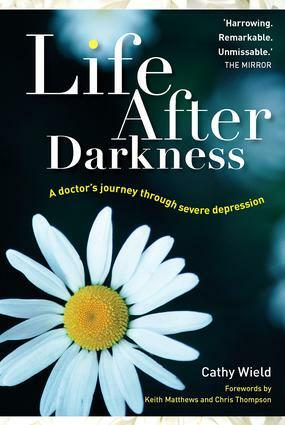 Life After Darkness is the remarkable and moving story of a doctor and mother of four who endured seven years of severe depression. Self-harm, attempted suicides and admissions to psychiatric units culminated in her resorting to brain surgery as a final attempt to escape her illness. The story of Cathy Wield covers the horrors of time spent in archaic institutions and the loss of any hope, to a full recovery following surgery. Today she has returned to her career and rediscovered the joys of life and her family. This story is one of hope from an often hidden and stigmatized disease. A promising future. Working mother. Falling into the pit. Time is no great healer. Freely consenting? Concerns for everyone. Torture made perfect. The therapeutic environment. Attempt at a slow death. Last resort. Winter of discontent. The new millennium. Summer, pain and shame. Dear diary. North of the border. The padded cell. Impatient and in disgrace. Interminable battle. The health commissioners visit. Mayflower or high security prisoner. A date at last. Never a dull moment. The end of the road. Light at the end of the tunnel. What on earth is email? Future considerations. A taste of the past. Postscript: in sickness and in health. Neurosurgery information sheet. Directory of organizations.